Uni Watch illustration Major League Baseball approved throwback Colt .45s jerseys for the Astros, but without a gun. You wouldn't expect to see gun control happening in Texas, but that's what will be taking place at a few Astros games this year. Here's the deal: The Astros are marking their 50th anniversary this season, so they'll be wearing an assortment of throwback uniforms for Friday home games. That includes the uniform of the Houston Colt .45s, which was the team's name for the first three years of the franchise's existence. But in a move that's outraging uniform historians and firearms fans alike, the Astros have decided to make a significant tweak to the Colt .45s jersey design. They're removing the smoking handgun. Ugh. Whatever your thoughts about the Second Amendment, this is a design disaster. What's the point of having a "C" formed by a whisp of gunsmoke when there's no gun to produce the smoke? Astros fan James Crabtree is so upset about this that he sent a letter this week to the team and to MLB commissioner Bud Selig. He received a response from Mike Acosta, the Astros' authentication manager, who told him, "During our discussion with Major League Baseball, it was expressed to us that we could wear the uniform as long as the pistol was removed. We realize this changes the original design, but we still want to honor the Colt .45s. We are also under an obligation to follow Major League Baseball's requests." This situation echoes a similar incident from last season, when the Rays wore Tampa Bay Smokers throwbacks but removed the cigar from the Smokers' jersey design. But the Smokers were a minor league team that had no connection to the Rays other than geography, while the Astros actually were the Colt .45s, so this latest situation feels like a more egregious example of revisionist history. It's nice that MLB doesn't want kids exposed to handgun imagery, but putting the kibosh on the original Colts jersey feels like a bit much. 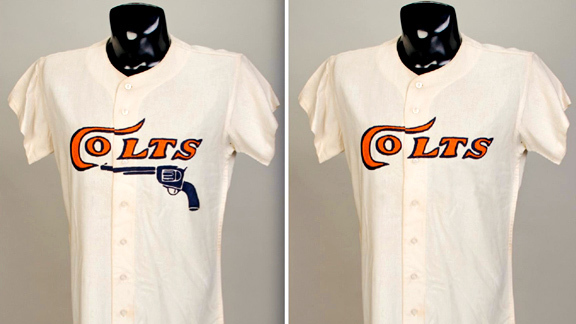 Would it be appropriate for a new team to call itself the Colt .45s and put a pistol on its jersey today? No, but things were different 50 years ago, and that's part of why we have throwback games -- to serve as history lessons, and to show us how things have changed. In this case, MLB has chosen to whitewash a chapter of the Astros' history. Too bad.